Digital piano featuring GHS keyboard and Yamaha CFX concert grand piano sample. The ARIUS YDP-144 is an affordable digital piano, perfect for students or hobbyists looking for an attractive instrument for their home. Newly sampled for the YDP-144, the Yamaha flagship 9' CFX concert grand piano offers sparkling highs and a powerful resonant bass combined in a sound that projects to the furthest reaches of any concert hall. 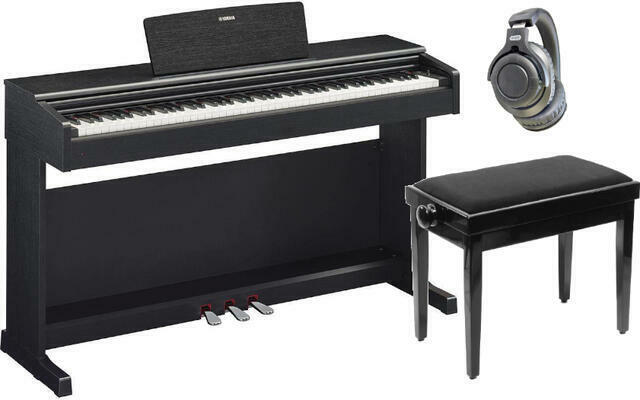 With an 88-key piano action, the Graded Hammer Standard (GHS) keyboard reproduces the touch of an acoustic piano, from the heavy feel in the lower register to a lighter touch in the upper octaves. With matte black keytops, the touch and feel of this keyboard action makes it comfortable to play for hours on end. The YDP-144 offers convenient functions for when you cannot always play the piano at high volume. Intelligent Acoustic Control (IAC) adjusts the sound automatically to allow players to enjoy balanced sound at any volume level. Stereophonic Optimizer lets players enjoy the natural, spacious sound experienced when sitting in front of an acoustic piano, even when wearing headphones. Luksuzna podstavljena klavirska stolica s ravnim odvojivim nogama, izrađena od odabranog bukovog drva. Koristeći rotirajući mehanizam sa strane, visina stolice može se prilagoditi od 46 do 59 cm. Tekstilno sjedalo stolice je također odvojivo. Beech drvo je obojano crno i ima završni lak. Boja sjedala: Tamno siva. Dimenzije sjedala: 32 x 58 cm. Težina: 7,2 kg. Maksimalni kapacitet punjenja: 130 kg. Imate Yamaha YDP-144B-YAM SET , ili ste ga već koristili?